I have seen so many people with pain whether it be emotional, psychological or physical and it all affects our posture one way or another. When we have back pain for example it has us in a state of vulnerability, and we often turn towards the medical solution of a pill or injection. This is only treating the symptoms and not addressing the cause. When we sit in a defeated posture we exit our vertical alignment within gravity, this is the real cause of our suffering. All suffering is, is a defeated posture within the pull of gravity. We must therefore change our habit of slumping and adopt the posture which is royal, taking responsibility for oneself joyfully. 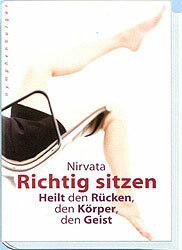 The book "Richtig sitzen" is available in the German language only, you can order it directly with the author. Enquiries for translations to other languages welcome.